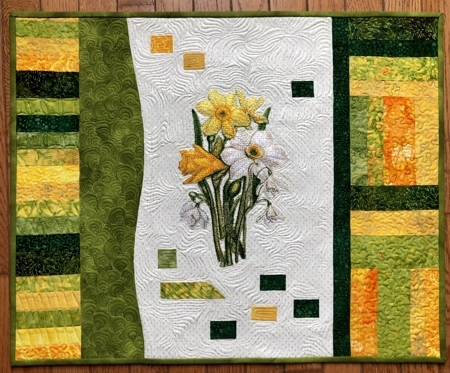 Although the Spring is still a little way away, we couldn't resist putting together this charming wall quilt with springtime colors. 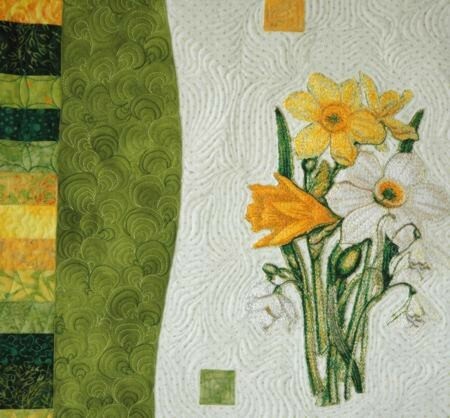 The quilt features the designs from the Spring Bouquet. The finished size of the wall hanging is about 26" x 21" . 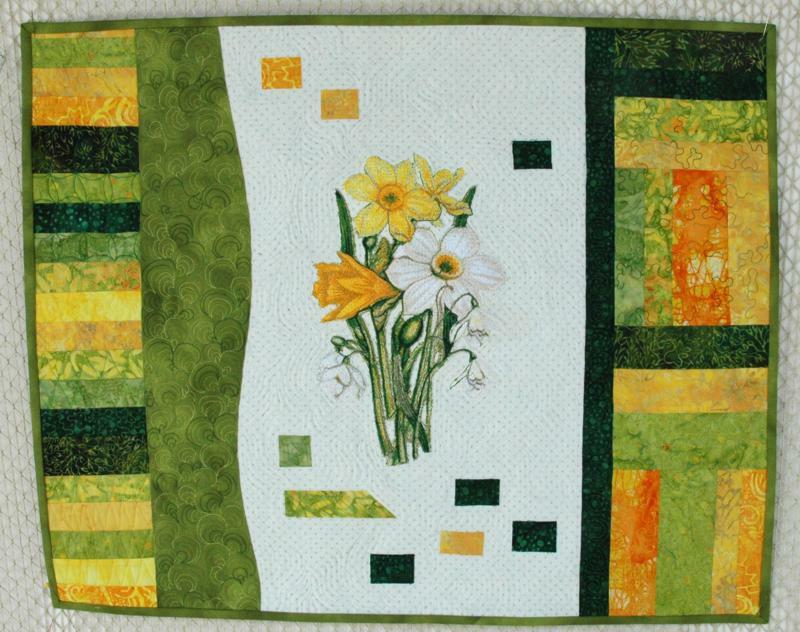 scraps of yellow and green fabrics. 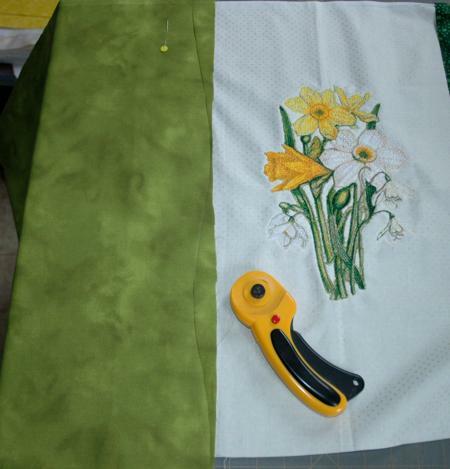 Tip: For best results, select the green and yellow scraps based on the colors of the embroidery. You will also need batting and fabric for backing and binding. For embroidery you will need iron-on cut-away stabilizer and embroidery threads. Lite Steam-A-Seam 2 double-sided self-adhesive fusible net, or a similar product, is optional, but useful. 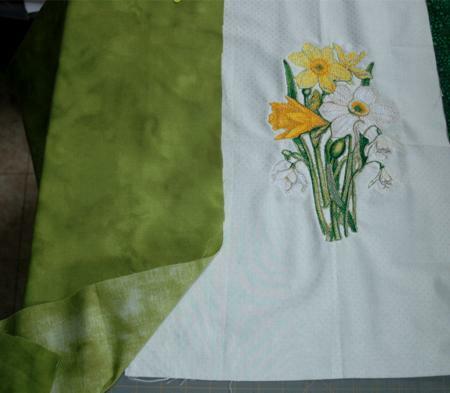 Stabilize the light-colored fabric and embroider the Spring Bouquet design in the center of the piece. Spread the embroidered piece on a cutting mat. Position the green strip along the left side of the piece, overlap both fabrics by 2-3 inches. Pin them together. With a rotary cutter (or a pair of sharp scissors), cut a curve through both fabrics. Position both fabrics face to face. Neatly pin, aligning the curved edges. Machine stitch with seam allowance 1/8"-1/4". Unfold the green layer, press the seam. Cut the left edge of the green strip straight. 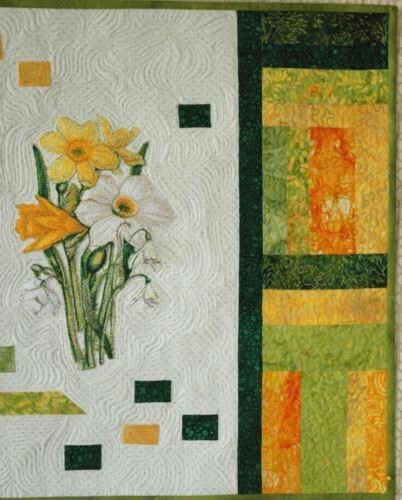 Cut the green and yellow scraps into strips 4" long, the width may vary from 1" to 2". We didn't use a fixed size to make the quilt more casual. Sew the strips into a strip 22" long. Press the seams. Sew the strip to the left side of the working piece. 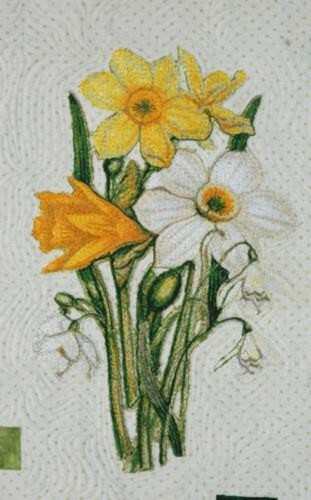 To make the right border, cut the embroidered piece 3" from the embroidery. Out of dark green fabric, cut a strip measuring 1 1/2" x 22". Sew it to the right edge. Out of green and yellow scraps cut strips 6" long, with a width of 1"-2". Sew the strips into 4 blocks. Arrange the blocks into a strip, as you can see below. Sew the strip to the right edge of the top. 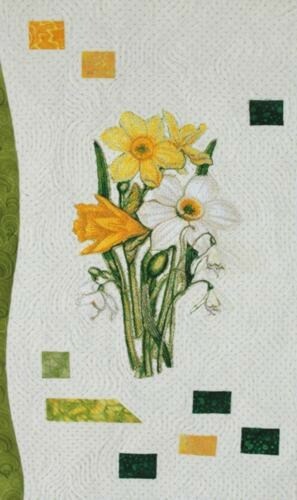 To make the large white space around the embroidery seem a little less empty, add several decorative "patches". 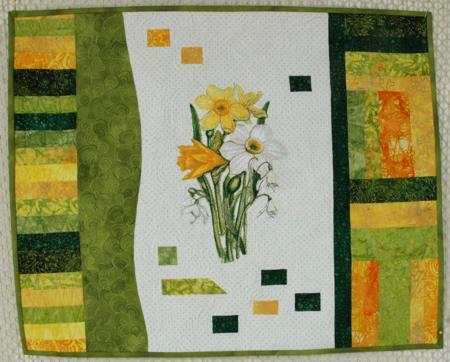 Out of green and yellow scraps cut small squares and rectangles. With the help of Lite Steam-A-Seam 2 double-sided self-adhesive fusible net, or a similar product, adhere them around the embroidery. You can also pin, then stitch them in place. Now place the backing/lining on a flat surface (table) face down. Cover with batting. Spread your working piece over it.